Hoo boy! Do I have a story with this one! I will begin at the beginning. I have been inspired to try my hand at paint on copper again. I did a small 6"x6" still life last fall and then never got back to it. 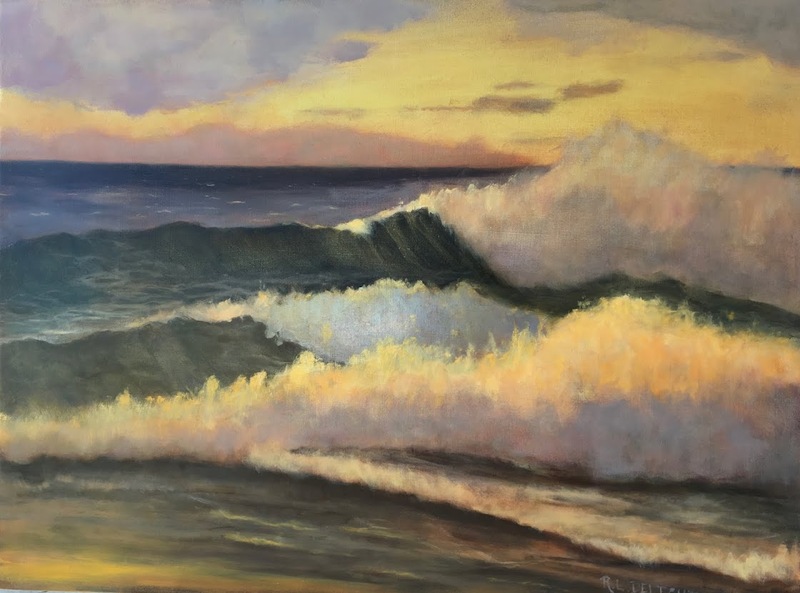 I started painting waves not long after that first copper painting. 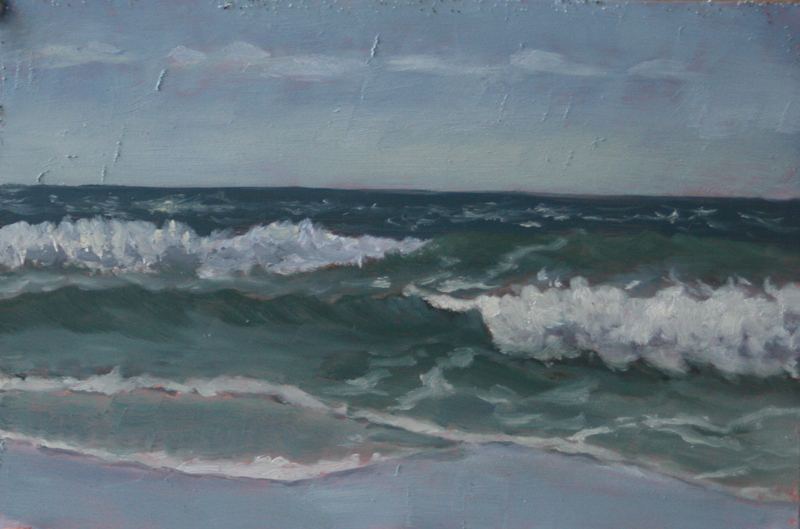 This is the first plein air seascape I painted on copper and it isn't finished. I was pleasantly interrupted before I could finish. When I started sketching and painting on the beach I would occasionally run into an older woman at the North end of the beach. I was instantly fascinated by her for some reason. She always had her Airedale dog, Megan, with her and she was escorted by a pair of crows she calls Click and Clack. I kid you not! They fly and walk with her on the beach every time. She feeds them and they know her well. It is really funny to see them walking their crow walk on the beach with her. They also know where she lives and will go to her house to coax her out. How could I not be fascinated? Turns out that was just the tip of the iceberg so to speak. We struck up a conversation. That is, I deliberately went up to her and started a conversation. I am very much an introvert but every once in a while I meet someone that I know I just have to talk to. Over the past two years I would run into her while I was painting or sketching at the beach and we would chat. She mentioned her husband was an artist, a sculptor, whose work is in public places all around Honolulu. She gave me her number and told me to stop in for tea. She was only available a couple days a week as she is an avid horsewoman. I am guessing she is in her late seventies or early eighties. I hadn't taken her up on her offer as I am a bit shy about inviting myself over to the house of a casual acquaintance. She was very kind though and I was definitely intrigued. I haven't seen her in a while and I was delighted to see her walking toward me this afternoon while I was working on this painting. The sun was out but there was a stiff wind blowing from the Northwest and I was starting to get quite cold. She stopped and we chatted and when she noticed me shivering slightly she promptly invited me to tea. Well, I couldn't refuse such a generous offer now could I? I quickly packed up and we walked the short distance to her house. I was very impressed. The house is very beautiful, not in a grand way, but in a elegant, Asian meets Pacific Northwest, way. The house has beautiful natural elements of wood and stone. It sits snugly amongst some shore pines which serve to break the prevalent wind. The view is breathtaking. It turns out that Phyllis is an interior designer who has done interiors of homes, ranches, and horse arenas around the Pacific Rim and the Pacific Northwest. But wait, it gets even more interesting! The house and grounds are filled with beautiful sculpture and art in wood, stone, and metal, all made by her husband Mick. That is, the American sculptor Edward "Mick" Brownlee. I was served a hot delicious tea and spent a fantastic hour talking art with Phyllis and Mick surrounded by the stunning art and view of the beach. As you can imagine, they are engaging story tellers and have led wonderful creative lives. Here is a link to the Wiki page on Mick. I have to say that there isn't a lot of his work shown in photos and what there is looks nothing like the sculpture I saw at their beautiful home. The sculpture reminded me of the native Pacific Northwest art with an Asian twist. I kept wanting to reach out and touch and feel it. It definitely fits our native environment. It was a wonderful way to spend the late afternoon. Both Phyllis and Mick gave me some creative advice to think about. I appreciate their gracious generosity and definitely enjoyed the beauty of the home they have designed and built. A final note about the painting, as I mentioned above, it isn't quite finished. I will finish it in the studio tomorrow. There also was a slight accident as I was handing the panel holder to Phyllis to hold for me. It is quite slippery and it ended up flipping end over end and landing in the sand. Fortunately, the painting landed face up. It would have been no problem if it ended up in the sand. I would have just wiped it down and reused it! There are funny lines on the sky and a tiny bit of sand along the top edge. A bit of realism included in the painting! Hopefully the weather will warm up. High tide is getting close to sunset now and it gets quite chilly with the cold wind blowing off the water. Well, this is a long post and it is getting late. Off to dream of painting. What an interesting and inspiring acquaintance! You make me wish I had been there too to meet Phyllis and Mick. Copper looks like fun. Thanks Dana! It certainly was an interesting afternoon.